I recently added the Bluetooth module to my 03 X5 4.4. 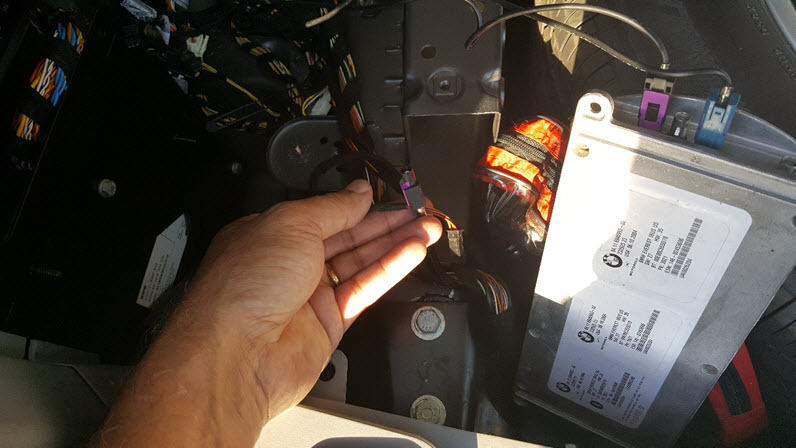 I was able to connect with the existing wires in the trunk. My phone connects with no problems, but when connected, there is a lot of static and the connection frequently drops. I realized that the car may not have a Bluetooth antenna installed, so I purchased one but I am unable to find where it plugs in. 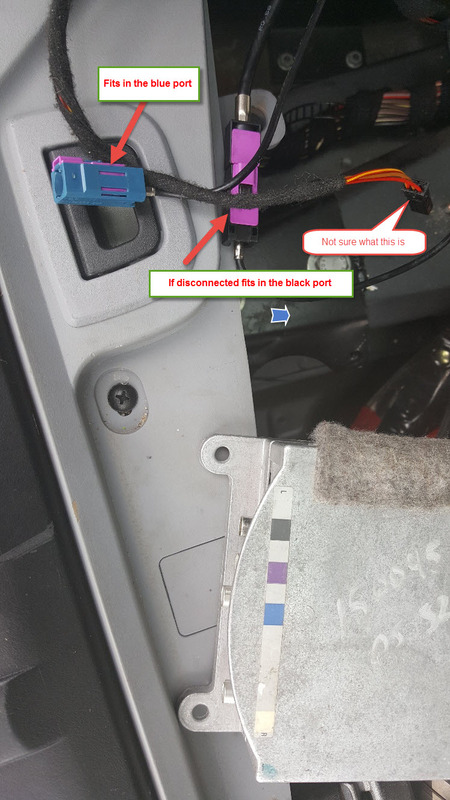 I've included some pictures of the trunk area and another one of underneath the center console where there is a purple wire that says Bluetooth antenna on it but I don't know where either end goes. Also, does anyone know what the colors on the Bluetooth TCU stand for? When I connect the Purple cable to the Black colored connection, the system works. It does not connect to the purple connection because it physically won't fit the connection. There is also a white and blue connection that I don't know what they're for. Say what you will, nothing drives like a BMW. TCU stands for Telematics Control Unit. The antenna is installed on top of the left hand side trunk shelf, the one holding the DSP, CDC, MK, ULF, and it plugs directly into the ULF unit. Thanks for the reply. I looked prior to the post but I have not seen the antenna. I'll look again this week and hopefully be able to find it. So , the purple cable that is shown in the post was actually a male and female already connected. Since I did not see any other cables that seemed as though they would fit the ULF during the install, I disconnected the two and plugged the female end into the ULF to make it work. It was a gamble and with it connected, the system works. Just lots of static and lost calls. Without it I get getting "function is currently not possible". I bought a used antenna and it's end also plugs into the female purple connector shown in the trunk but it leaves me with nothing else to connect to the ULF. Even with the way it is now, the purple female wire connects to the ULF leaving the male connector set aside and the system does not work. Is there a wire that I am overlooking? The car seems to have all the buttons and wires that would enable the upgrade to be done, but something just isn't right. Any pics would be great if you can advise. Ok. I just took a qiuick look at my 2006 X5. On your picture #1. At the back of the ULF module. 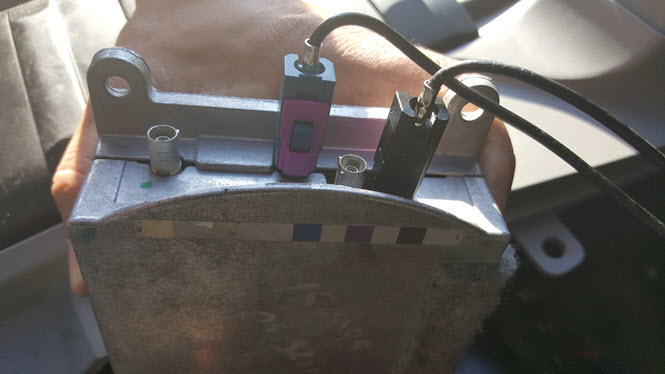 The very top White color connector was plug in and same as the last one at the bottom Black color with the purple connector. The 2 in the middle (blue and purple) are not use. You also need to insert the big plug in the front. Hope htis help. Did you ever get this figured out? I am facing the same issue. However my phone does not find my car. I get message stating "Phone connected?" Mine ended up being the Bluetooth antenna cable... it was missing. I had to buy it from eBay. Connected it off eBay and once in place it worked like a charm. Which one is the antenna? I have the purple cable connected to the black dot port. I also have a lose wire fits nonwhere. I will post a picture here tomorrow or so. Sorry to highjack this thread. No matter what I do, I only see message "PHONE CONNECTED?" I do not know where the antenna goes. I dont even know if I have one. As you did I disconnected that purple female plug it plugs straight in to my black port. I also found a black plug that fits in to the blue port. I am at loss, I cant get this thing figured out. Also see the black connector. I am not sure what that is. I thought it was the antenna. 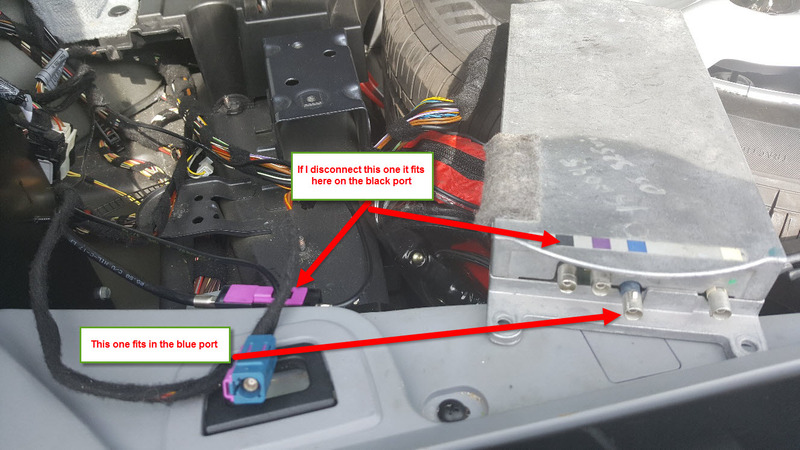 There's a few pictures of the OEM BT antenna and connections in this article - they may help you. I checked the link above, no luck. I am still not sure if I have an antenna at all, or if I dont't I would not know where to plug since the site mentioned above does not show my TCU. Below are more detailed pictures of what I am fancing.